Final Update: I’m working on a follow-up post, but thanks to all the comments, it seems that somehow during the Snow Leopard to Lion upgrade, the /etc/hosts file was encoded incorrectly (likely the type of newlines used), and that Lion would fail to read it properly. Please try to copy the contents of the /etc/hosts file, recreate the file, and paste to fix your problem. Update: I was still having problems with using .local for my development sites. After some extensive debugging and research I’ve found out some interesting things. It appears that Multicast DNS (mDNS), which is used in Apple’s Bonjuor for network discovery without a tradition DNS Server, has the Top Level Domain .local reserved for special mDNS functionality. Mac OS X will treat domains ending with .local differently! Use another TLD, like .dev, and it will work correctly. This article will still help you fix problems with /etc/hosts abnormalities with it not having the correct priority. Then it will work correctly. Second, I ended up doing a fresh install of Lion and this problem has gone away for me. So it appears that this issue would affect some people who upgraded from Snow Leopard. So as Chris suggested below, I don’t think it has to do with the resolve order. I haven’t been able to figure out the difference between Lion installs that work correctly, and those that don’t. So if you are have the following problems, the suggestions below will work to fix it. This morning I was up a few hours earlier than normal today, and was looking forward to getting in some solid programming hours earlier so I wouldn’t work late tonight. 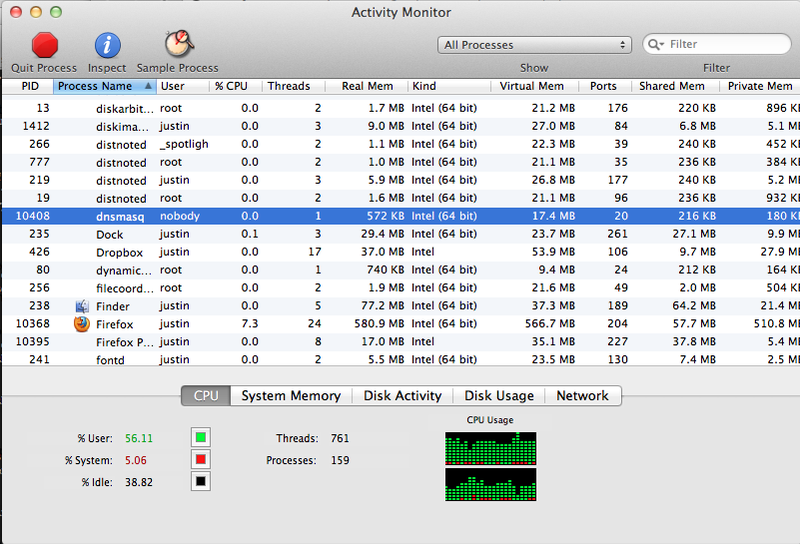 Instead, I spent about four hours fighting a new change (I’d call it a bug) in Mac OS X Lion. Now, instead of running a full blown DNS server on my machine, which is overkill and more work to edit and maintain, I would make manual adjustments to my /etc/hosts file. For those not familiar with the /etc/hosts file, it allows you to add entries that traditionally your computer will look up first before trying your server DNS. This is where your computer would set “localhost” is the IP “127.0.0.1”. I use this a lot with local development. For example, when I work on joind.in, I use MAMP and create a VirtualHost for the code under the server name local.joind.in (i.e. http://local.joind.in/). I don’t have access to the joind.in DNS, so I create an entry in my /etc/hosts file. You have to have admin permissions to edit the file, so I normally run the command “sudo nano /etc/hosts” and make my changes and then save. Now, my actual /etc/hosts file contains 83 entries. Some are just short cuts to machines I often connect to. Sometimes during a migration when I’m making DNS entries, I can make the change in my /etc/hosts file as well, so I don’t have to wait for the DNS changes to propagate to test. All in all, it is a very handle little file that I use a great deal. Even windows has their own hosts file that works well. There was also reports about the order of IPv4 and IPv6 entries (blog post about it). I personally did not have this problem, but others seem to have had it. The problem was that OS X Lion seemed to ignore IPv4 entries after a IPv6 entry was made. However, anytime I made a request in Chrome to any of those domains, it would take 5.01 seconds. At first I thought it might be a bug with the new version of MAMP for OS X Lion. But I found using Chrome’s & FireFox’s developer tools that it was taking 5 seconds for the DNS lookup, and 0.01 seconds for the rest. So I would go into my terminal and ping the domain. It worked just fine without the delay. Apparently, the terminal and some of the BSD Unix tools correctly use /etc/resolv.conf and the correct order of /etc/hosts first and then DNS servers. However, everything else on OS X Lion, including all of your Applications, do it backwards! This wasn’t the case in Tiger, Leopard, or Snow Leopard. The only solution we have, that I could find, is to use your own DNS Server locally on your own machine. I’ve heard of others setting up BIND on OS X. Now, the problem with this solution is that it isn’t nearly as quick and easy to manage DNS entries. Then, I found out about DNSMasq. It is a lightweight DNS server that is easy to configure. However, it had one key feature we needed: it will read the /etc/hosts file and serve it’s entries. This means we can have our OS check the DNSMasq instance first, which will check the /etc/hosts file, restoring the proper order. After some Googling around, I think installing dnsmasq using MacPorts is the easiest. First, you’ll need to install Xcode so your machine can compile with the tools. It is free on the Mac App Store (warning, it is a kind of big download). Then, you’ll need to download and install the MacPorts for Lion. If you already have MacPorts installed, make sure it is the current version of Lion. One thing I like to do is control which DNS Server’s dnsmasq will use. By default it will use /etc/resolv.conf, but OS X will overwrite that file on reboot and anytime you change internet connections (like switching wifi hotspots). So I would copy /etc/resolv.conf to /etc/resolv.dnsmasq.conf. When dealing with files in /etc/ and /opt/ you’ll need to run these commands using sudo. Then I set dnsmasq to read my new resolve.dnsmasq.conf by setting “resolv-file=/etc/resolv.dnsmasq.conf” in /opt/local/etc/dnsmasq.conf. 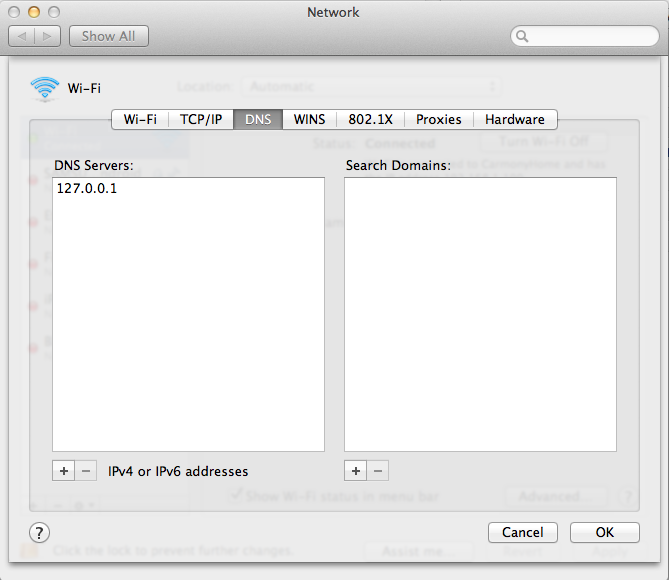 Now, we need to configure OS X to add 127.0.0.1 to our DNS Servers. Go to System Preferences > Network > (Select Connection, i.e. Wi-Fi) > Advanced > DNS. You can have other DNS entries, like Google’s DNS Entries (8.8.8.8, 8.8.4.4). Just make sure 127.0.0.1 is on top. This is a lot of work to setup (especially if you don’t have Xcode install). However, it will work, and give you a lot more control over your DNS. So in a way it is an improvement! Just wish it wasn’t necessary. Why is this necessary Apple? Security – Maybe, just maybe, it was for security. Technically, a virus can overwrite the /etc/hosts file if it the virus can prompt the user for their password to run a command as root. So you could maybe have a user visit http://www.google.com when in reality it isn’t a google server. But even then, HTTPS wouldn’t work without ugly errors. So this might be a reason, but out of all the things that can go wrong with a virus, it is a poor excuse. The virus could just hack mDNSresponder to use /etc/hosts. Prevent User Hacks – Most likely, I think this is why Apple made this change. I know with jailbreaking iOS devices and getting hacked apps, iTunes will try to validate an App by “phoning home” to Apple. However, if you change the entries in your /etc/hosts file so iTunes can’t reach the correct Apple Servers. I know people who have circumvented other software activation systems do the same technique. I think this is why Apple made the change, though at the expensive of all the professionals who actually use /etc/hosts for work. An Honest Bug – It is possible this was a bug, but seeing as how you would have to deliberately change the resolve orders for the operating system, I doubt this is the case. If this was an intended change by Apple, it is a frustrating one. One of my favorite things is that underneath the OS X’s nice UI and Applications is a BSD Unix system. I love how I can compile and install so many things just like I would on Ubuntu. But if they continue to change that Unix underbelly and make it less and less like it is everywhere else, then I think they’ll be frustrating many, many professionals. Hopefully in the future I’ll find a way to change the resolve order in Mac OS X, but until this, this is how I worked around the problem. Thank you VERY much, this 5s timeout was driving me mad! For me, just changing from .local to .dev solved it. Thanks so much, I just googled for “long delay when calling local host mamp” and your post popped right up. Changing form .local to .dev just saved me hours of debugging 🙂 It solved my problem. Thank you so much for posting this – helped solve that 5 second problem I was experiencing. Unfortunately, adding a local DNS server in System Preferences throws away any DNS servers that are assigned by a DHCP server. Is there any way to have a local DNS server (127.0.0.1) in addition to the DNS servers assigned by DHCP? Solved my problem with localhost not resolving with Apache 2.4.1 under OS X Lion. I specified “Listen my.numerical.IP.addy:80” at or near line 50 in my Apache configuration file. When I changed it to “Listen 80” only, everything began working as expected. Thanks – you saved my sanity. I spent hours late last night trying to figure out if it was nginx, passenger or my slightly not-quite-supported build of ruby on OS X Lion via RVM that was at fault – should have checked the browser network profiling first I guess…forest for the trees. To restart dnsmasq, send it a HUP signal. Thanks a lot for this! Solution from the final update works for me. This is what solved it for me: The line ending of my hosts file were Mac Classic (CR), which is wrong. Open it using TextWrangler ( http://www.barebones.com/products/TextWrangler/ ) and on the bottom of the window, in the middle, you must change is to Unix (LF) and save it. Boom, worked. I didn’t actually find this site via an issue with .local, but discovered DNSMasq, saw that it would be a perfect solution to a problem I was having (which included skipping the hosts file for each new entry I added), and went in search for a good post explaining how to set it up, and that post was this one. Thanks! I’ve found yet another workaround for the problem. If you can choose the suffix for your local domains, try “.localhost” instead of “.local” or something else (that is, use domains “foo.localhost” instead of “foo.local”). It seems that Mac OS X has a shortcut for “localhost”-type domains. Thank you so much! This solves my problem. I used homebrew to install dnsmasq. Thank you for this. We us a special internal domain name at work that is a unique tld. For people inside the company it seems to be fine. But for people that VPN into work and need to use one or these special tld domains, then it fails for people on OSX. People using Windows or Linux have no problem resolving these special tld’s. Once dnsmasq was installed and configured all was well. I aslo used homebrew to install dnsmasq. I just wanted to thank you for your post. I spent more of my night than I’d care to admit tracking down mDNS issues and tweaking my /etc/hosts file only to realize I was being impacted by the multiple hosts/line bug (FWIW in Mountain Lion I can get 10 hosts to a line before it breaks). Thanks.I was able to intall dnsmasq succcessfully with my os lion. I have this problem where in I have to refresh browser to load the page for my development site. Because it will load initially the working site. Thanks again. I still have no idea why my /etc/hosts file wasn’t (isn’t) working, but this saved me from further grief. Many thanks. Have you perhaps checked that your file didn’t accidentally get the line endings changed from n to r? Ah, and of course the forum software strips the gt/lt characters instead of converting them to html entities. And then I paste the wrong thing. Go me. Which step makes the hosts file load before the DNS servers? You didn’t mention what goes into the resolv.dnsmasq.config file, do we need to edit anything in there? Thanks. Good web site you’ve got here.. It’s hard to find quality writing like yours nowadays. I seriously appreciate people like you! Take care!! Changing the line endings from CR to LF solved it for me. To products a fuller perception of area, a much further thorough advanced education experience and too to create the entire normal commencing the university. Clothed in his peculiar lexis, Robert Zimmer, Leader of the University allied with Chicago. Hiya. Vastly nice website!! Guy .. Magnificent .. Superb .. I’ll bookmark your website and assume the feeds also…I’m satisfied to locate numerous helpful information here within the article. Be grateful you for sharing.. The the next time I read a blog, Im hoping whos doesnt disappoint me about that one. I mean, I know it was my replacement for read, but I really thought youd have some thing fascinating to talk about. All I hear is really a number of whining about something you could fix when you werent too busy searching for attention. Thanks a lot, it works for me!! Some truly nice and utilitarian info on this site, likewise I think the layout holds superb features. “.local is reserved for special mDNS functionality” – priceless… Computer gods are agains me. Anonymize your trusty old true IP address, and additionally fly under the radar. Thanks for telling me this!